The brains behind tomorrow’s battle-droids: the president of defence robot developer Boston Dynamics is preparing to take the firm’s BigDog robot even further. Humans have a strange response to things that are lifelike, but not alive. It makes some people profoundly uneasy. Think of waxworks that look almost – but not quite – like the people they’re modelled on. Think of animated films where the characters look almost human, but their skin is too waxy and the eyes are glassy. It’s known as the Uncanny Valley, and to watch the videos of Boston Dynamics’ robots is to take a trip into its depths. Spun out from the Massachusetts Institute of Technology’s Leg Laboratory (now called the Robot Locomotion Group) in 1992, Boston Dynamics designs and builds dynamic robots that move like animals. Its best-known product, BigDog, is a four-legged robot that, yes, moves like a big dog, trotting eagerly along a variety of different terrains, stumbling and slipping on ice, then righting itself and continuing along its dogged path. But it’s very obviously a machine. Its limbs are metallic, with exposed joints and servos. Its body is oddly humped. Its two-stroke engine emits a constant eerie whine. It doesn’t have a head. 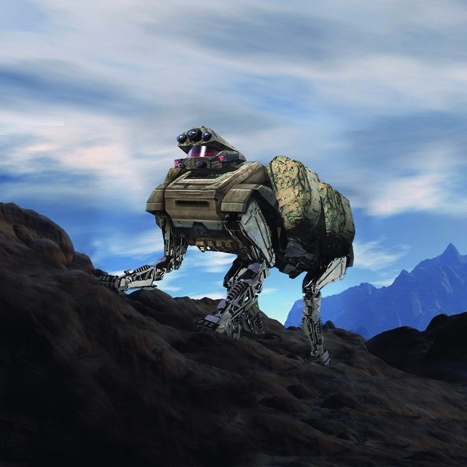 Raibert’s efforts have borne fruit recently, with a $32m (£20m) award from DARPA, the US Defense Advanced Projects Agency, to develop BigDog in a project called LS3, the Legged Squad Support System. 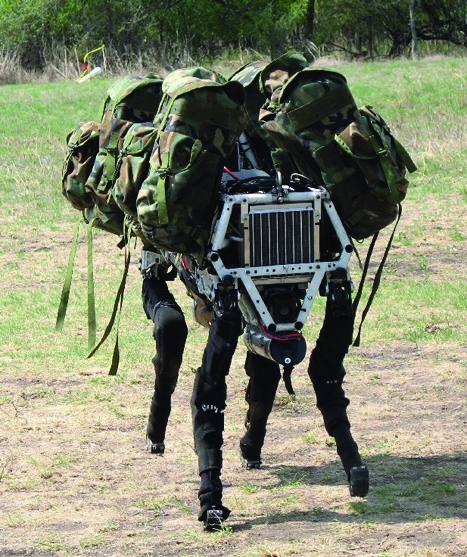 LS3, a 30-month project, aims to develop a prototype, field test-ready ’robotic mule’, that can carry a squad’s packs and equipment, bearing loads up to 400lb over distances of 20 miles over rough terrain, in missions up to 24 hours. The challenge of making a robot that moved like a living thing was the focus of Raibert’s time at the Leg Lab. ’If you go back to the early days of walking robots, the approach was to make them move slowly, just figuring out where to put its feet so that it balances, like a table balances. After that, robots began to play a much bigger part in the company, and today Raibert estimates that they comprise two-thirds to three-quarters of Boston Dynamics’ work. ’We have weirder things than BigDog!’ he enthused. ’We have a six-legged robot that has legs which are half-like a leg and half-like a wheel; we have a wheeled robot with a special leg that allows it to jump about 10m; we have snake-like robots. A cynic might ask why go to the bother of creating robots with legs, when tracked or wheeled vehicles can do the job? It’s just not true. Wheeled and tracked vehicles can cover a very small fraction of the Earth’s surface; people and animals can go almost anywhere. It’s not true yet that our robots can go anywhere, but that’s our goal, to go where wheels and tracks can’t. Do you look for particular animals that can handle particular sorts of terrain, and model a robot’s movement after that? No, we take broad inspiration from nature. In presentations, we frequently show mountain goats in very difficult terrain, and we’ve worked with biologists – on BigDog, for example, we had a group from Harvard’s biology department – but we can only take broad inspiration. We can’t replicate the microstructure of animals yet. We can’t make muscles like they have, we can’t have as many degrees of freedom in our systems as they have. Look at the hooves or feet of an animal, and there’s all kinds of stuff going on, and it’s hard to capture all of that, as engineers. There was a ’yet’ in there. I think as the field gets more sophisticated, we’ll be able to do more. Our six-legged wall-climbing robot has a lot of microstructure in its feet. People we work with are using gecko-like Van der Waals-type adhesion forces, which aren’t ready for prime time just yet, but in 10 years’ time you’ll see robots with very sophisticated dry adhesive feet. We did have a project with micro-hooks in its feet; up to 50 very sharp structures on carefully designed spring systems, and we’re now using more sophisticated processes to make these elements. But we’re still nowhere near animals. A bug might have hooks, plus Van der Waals elements, and all kinds of stuff; it’s amazing what nature can pack in. Are you looking at any non-defence applications for your robots? We’re interested, but so far, the main other field for this type of robot is entertainment, and we don’t have any activity in that direction. To be honest, there’s so much defence-related stuff to do, and robotics is growing so fast with so many projects, we’re hiring as fast as we can. Are there any plans for your robots to carry armament? But do you have concerns over the ethical side of how the robots might be deployed? I’m an engineer who builds robots; I don’t know why people would be interested in my views on the ethical question. The big thing is that some people think the designer should be responsible for all possible uses of the system, and others think that the designer is just building a platform and someone else is responsible for the ethics of how it’s used. I look at our systems and I say they’re vehicles. You could put sacks of rice on them. You could put bullets on them. Their use is to go to places on Earth where you can’t put vehicles now – and there are a lot of uses that can be put to. I’ve been thinking about this, and I’m not sure that I have the answer yet. Because you are getting rich, building machines to help make killing people easier, when you obviously have skills that could be used for good, and not evil. That’s why they are interested, what an unpleasant individual…. Ofcourse, they will be used for especially military needs in everywhere, maybe will be used as an item for marketing; no matter for war or industry… This is the reality..
Well, I don’t think so.. I don’t teach deep things anyone..